Just as pomegranate seeds burst with flavor and juice in one's mouth, so too does the painting Madonna and Child by the School of Sandro Botticelli, which explodes with meaning as baby Jesus Christ feeds his mother Mary a pomegranate. At first glance, one simply sees another version of the iconic image that inundated the art world in the late Middle Ages. The typified painting highlights Mary as Madonna, or "My Lady" in Italian, and her role as a holy, yet human mother to Jesus. However, this portrayal of Mary and Jesus with a pomegranate not only represents their bond in divinity and humanity, but it suggests that the fruit of their love is the Holy Spirit and brings hope to humanity for a new and deeper connection with God. 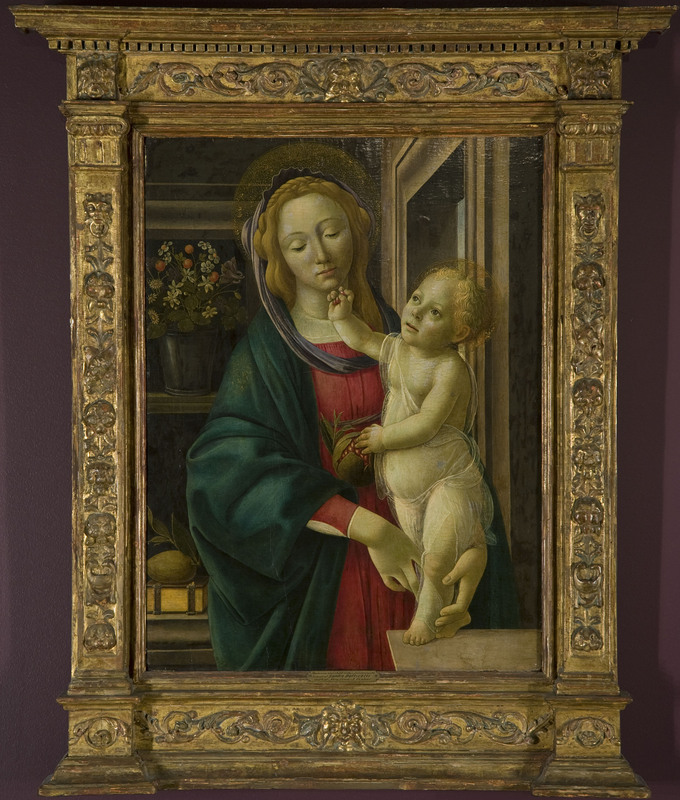 Through details of lighting and position, the painter reveals that the relationship between Jesus and Mary is far more complex than one between mother and son. A golden and ornate halo, created with a glistening oil, circles both figures' heads and signifies their holiness, contrasting with an unadorned, darker background. Mary, with a serene, composed nature, serves as Jesus' support on Earth as she gently aids him in standing, albeit he stands quite independently for a baby. This oddity in human behavior, in addition to the contrast between Jesus' open eyes and Mary's shielded eyes, displaces the bond between Jesus and Mary from normality. His kind eyes gaze at his mother with an awareness and wisdom that would be atypical at his age, and they cast a peacefulness over the scene. As Jesus feeds Mary pomegranate seeds, he reverses the roles of mother and child, nursing his mother instead of the conventional nursing of son and portraying their mutual need for one another. With Mary looking down and Jesus looking at Mary, what becomes the core of the painting is the midpoint of the two gazes: a pomegranate seed. In ancient Greece, pomegranates were known as the "fruit of the dead", but in this painting, they transform into a fruit of life (Lansky). Held close to the womb of Mary, the ruby red fruit calls to mind the Catholic prayer "blessed is the fruit of [Mary's] womb, Jesus." Mary gave birth to Jesus, who teaches humanity about God and the path to salvation, spreading the fruits of the faith. In fact, several cultures respect pomegranates as symbols of fertility and immortality, so through his birth, Jesus brings new life, and possibly eternal life with God, to man (Stover). University of Notre Dame: Gift of Mrs. Fred J. Fisher, 1951.004.001. While fruit nourishes the physical body with nutrients, Jesus' fruit nourishes the soul, acting as the Spirit of Life, one of the many names for the Holy Spirit. Mary's red dress matches the red pomegranate, which suggests that Mary absorbs the spiritual nutrients of the fruit and of the Holy Spirit. Ancient Hebrews equated the number of pomegranate seeds to the number of virtues one possessed, so Mary, the perfect human devoid of sin, appears one with the Holy Spirit and attains the same coloring as the pomegranate (Lansky). Although the color of her vestments sets Mary apart from humanity as completely holy, she still represents the rest of man, encouraging them to receive virtues from the Holy Spirit. The star on Mary's teal cloak, made with the same gold oil as the halos, reinforces Mary as a guide and model for humanity to follow. Because the star rests on her right shoulder, where the Holy Spirit falls during the Sign of the Cross, the star marks the presence of the Spirit in Mary and in her relationship with Jesus. By patiently helping humanity to acquire the fruits of virtue, Jesus works with the Holy Spirit to increase man's spirituality and connection with God. The pomegranate and the clothing also point to a renewal of man from their Original Sin with regard to the biblical story of Adam and Eve. Jesus' sheer, white veil reveals his naked body underneath, depicting the pure and good state of man before sin. On the other hand, Mary remains fully cloaked, which both represents the sinful state of humanity and separates her holiness as human from Jesus' holiness as human and divine. While the apple of Adam and Eve indicates the temptation of man and sin, the pomegranate of this painting is a new kind of apple that denotes new life, joy, and love. The other fruits and flowers in the background, including strawberries and daisies, set the painting in a fresh Garden of Eden, helping to recreate the story of humanity. By contrasting this painting to aspects from the original creation story, the painter urges man to grow closer to God in faith and to redeem themselves from Original Sin. Overall, Madonna and Child illuminates how Jesus and Mary work to spread the Holy Spirit across mankind. The pomegranate becomes the fruit of the womb, the Spirit of Life, and the fruit of virtue, but moreover, the painter weaves into the image the fruits of the Holy Spirit: love, joy, peace, patience, kindness, gentleness, goodness, faithfulness, and self-control. Because Mary and Jesus Christ emanate these virtues, one recognizes that the pomegranate, the fruit of the Holy Spirit, brings new life in man and that they too can nourish their lives with these virtues. In a similar fashion to the painting, this essay intertwines the fruits of the Holy Spirit in its words, yearning to reveal the virtues that will lead man to God. Originally from Roswell, Georgia, Olivia Barnard currently lives in Breen-Phillips Hall at Notre Dame and studies English with a supplemental major of Applied Computational Mathematics and Statistics. In her essay, which analyzes the meaning of a pomegranate in one version of the typified painting Madonna and Child, she aims to portray how a singular detail like the fruit adds unique meanings to the piece. Inspired by the intricate artistic technique and the multitude of juxtapositions within the painting, Olivia explores the bounds of human and divine relationships from varying stances, with regards to Jesus and Mary, as well as God and humanity. Following graduation, she plans to become an actuary and further her writing, continuing her development of mathematics, English, and looking at things from different perspectives. Olivia would like to thank her professor, Cornelius Delaney, for his refreshing outlook and conversation on many forms of literature and art. Lansky, E., and S. Shubert, and I. Neeman. "Pharmacological and therapeutic properties of pomegranate." Options Méditerranéennes Ser. A, 2000, 42:231–235. Stover, Ed, and Eric W. Mercure. "The Pomegranate: A New Look at the Fruit of Paradise." HortScience, 1 Aug. 2007, hortsci.ashspublications.org/content/42/5/1088.short#ref-44.